bums on seats, or, to be more precise, bums on saddles. a bewildering array is on offer to the modern cyclist, often without the faintest idea which would suit those bum cheeks best. a bit like all those telly ads for car insurance, i find it hard to believe there is a large enough market for so many variations on one theme. what they all have to have in common nowadays is a common width between the rails, no matter the material of which those rails are made. aside from those dumb seatposts with no clamp at the top, if a saddle is to reach the widest market (pun intended), it needs to fit all the seatposts from the world's component manufacturers. other than that, it seems that almost anything goes, though i'll admit that some of the subtle differences are lost on me. 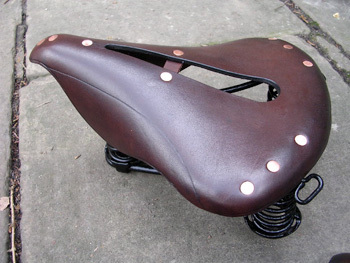 while at one time every cycle saddle was made from tanned leather spread over a metal frame, a la brooks, look on the underside of the saddle on the steed du jour, and disappointingly, it will likely consist of a leather type fabric stapled onto a plastic, resin or carbon base which gives the saddle its shape. the staples are underneath, thus maintaining the slick, streamlined look seen from the top, and it may well be that this is the most efficient method of modern saddle construction, but it's a bit like discovering there's a zip underneath that carbon downtube. 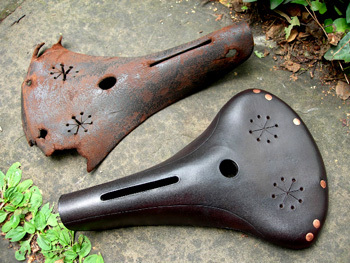 thankfully brooks still make leather saddles the old-fashioned way, the proper way, if you like, but what happens if the elderly bicycle you're restoring, needs a period saddle to maintain that authenticity. 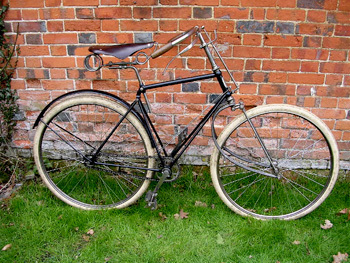 it's unlikely a bicycle from the early 1900s could live with a carbon razor blade on an ageing, non-standard seatpost. it just wouldn't look right. tim dawson, who i met through the non-introduction by a mutual friend is a committed bicycle restorer; he has a collection of vintage bicycles that would make most of us drool. tim lent one of his pre- twentieth century bicycles for rapha's recent 100 years of the bicycle exhibition in the now sadly demised cycle club in london. i met tim dawson dressed in a fine set of tweeds earlier this year at the tweed ride in the country's capital, a day slightly too warm for a full three piece tweed suit. but pride bears no pain, and tim rode the full distance so attired. conversation is a major part of the tweed ride, and i discovered that, in the process of restoring elderly velocipedes, he had often found it necessary to reconstruct period leather saddles from the remains of the original seating arrangements. such skills as are necessary to accomplish this, do not arise from thin air. at a subsequent meeting in the rapha cycle club of all places, tim brought along an example of a saddle he was working on at the time; the phrase 'we are not worthy' has never seemed so apt. "in 2003 i took a course in saddlery, of the horsey type. i told the excellent teacher, david may, that i wasnÕt the slightest bit interested in horses and wanted to mould a bicycle saddle! luckily he was a keen cyclist and was more than happy to guide me.Êwe also went out on a couple of nice rides together up in cumbria. "after that it was a question of learning by myself. there's only really one other guy, tony colegrave, who makes saddles, and his work is beautiful. heÕs also been a great help, as he always has more than enough work and has kindly passed on some very useful advice." in much the same way as undertaking any new activity, there is the perennial question of specialist tools to not only make the work easier, but in some cases, to make it happen at all. "most of the tools are those used for general leatherwork. i prefer to buy vintage tools which I find at jumbles like the beaulieu autojumble. woodworking skills are also very handy." general leatherwork i can sort of understand, given that the principal material required to create a new old leather saddle is rather obviously leather. but on checking my small collection of brooks saddles, i can see no evidence of any wood. can this be correct? perhaps it's better that tim describe the process of creating a leather saddle. "making a saddle is a lengthy process, taking about three days. first you have to make a block out of wood to the exact shape of the inside of the old saddle. this has to be pretty accurate. the leather is then soaked and subsequently moulded over the block, and tacked down. while it's wet i dye it to the required colour,Êthen it's left to dry for a day or so before being cut off the block in the correct shape.Êthis is largely done by eye. final shaping is done on a machine before the fun bit of the finishing work; edge finishing. putting lines around the edges with a creasing tool, cutting the vent etc. finally the cover is riveted to the frame with solid rivets, and some leather treatment applied. i suppose it takes about seven hours of actual handwork. however, one slip at any stage and the cover is scrap! as you might expect, bearing in mind all the time and handwork involved, as well as the cost of the finest leather, my saddles are not cheap." so now we know where the woodworking skills come into play, something that rather lets me out of the equation, since i have barely the technique to produce a door wedge. but you'll notice from tim's description of the saddle making process that after the leather is finished he rivets the shaped item to the saddle frame. but where the heck does that come from? it's one thing to fashion leather, a fairly malleable material, into a verisimilitude of a bicycle seat; it's an entirely nuther ball-game altogether to bend metal into a frame to which the leather can be attached. so firstly, where does tim acquire the leather, and more pointedly, where does the frame come from? "the leather comes from a wonderful tannery in devon which has been carrying out oak bark tanning for over 400 years. their leather is used for the soles of the finest shoes by makers such as lobbs, as well as for horse saddlery. the leather is from english hides and of the finest quality. the oak bark process does not use the nasty chemicals that a lot of other tanneries use; and the leather they produce is beautiful stuff to work with. 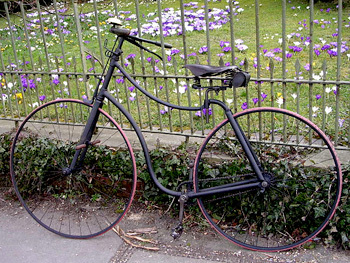 the saddle frames are supplied by the customer, sometimes with the original broken cover, sometimes without. i use my archive of brooks and other saddle catalogues to find the correct shapes." from many of the elderly machines i saw during the course of this year's tweed ride, it's obvious that bicycle restoration is a painstaking process, and one that cannot be unduly hurried. however, the saddle making skills described above are most certainly not for everyone. as i have detailed often enough to induce boredom, i'm fairly adept at wheelbuilding, but that's precisely where everything stops. i know my place. so given the number of folks involved in restoring old bicycles, and lets face it, as time marches on, there will be more and more elderly bicycles requiring such tender loving care, what's a guy/gal to do for a saddle? with a burgeoning market not only in retro, but in the appreciation of techniques and quality bespoke products to decorate even the modern bicycle, is tim willing to accept work and/or commissions from interested parties? "i mostly work on saddles for 19th and early 20th century bicycles, but iÕm happy to undertake bespoke commissions for any type of saddle. i've recently been experimenting with a new style of cover for a brooks titanium swift. however, in common with the tony colegrave (who also uses leather from the same tannery) the saddles are not as durable as, say, a brooks saddle. their saddles are made from fully tanned leather stamped under very high pressure in a mould. 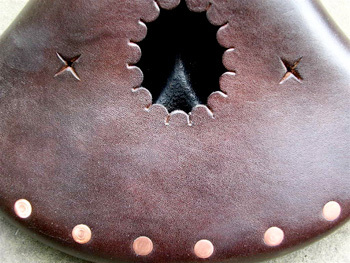 when you hand-block a saddle you have to use partially tanned leather, which is not as ÔgreasyÕ, because fully tanned leather of the thickness required is impossible to mould successfully by hand. so the saddles are suitable for limited use, but have the advantage that they are comfortable right away! provided they are protected from getting wet (as with any leather saddle) they will last, so they are ideal for vintage machines or the Ôsunday bestÕ bike. iÕve ridden a couple of thousand miles on my ordinary (penny farthing) saddle, and it's hardly stretched." it strikes me that, having acquired the skills necessary to make works of art as shown accompanying this article, their may well be room for a bit of lateral thinking, and lateral building. so does tim find the time to make other similar items for the bicycle, modern or otherwise? 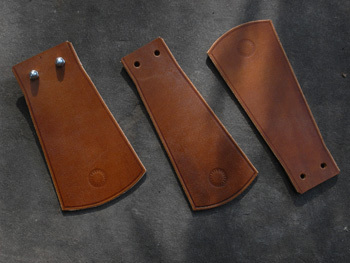 "i also make other leather items such as tool bags and made to measure mud flaps, and can also replace the leather on toe straps where period detail is important.Ê one of my most recent projects was to refurbish a brooks ÔcyclistÕs' wallet tool bag from 1888. it was horribly squashed, so I re-blocked it back into shape and replaced the broken straps to exactly the original spec. it's worth spending the time on rare early items like that. so, if you've a rusting hulk in the corner of the bikeshed that you fancy bringing back to life, it seems that tim is the very chap to alleviate any concern over the saddle that barely clings to existence atop the post. or if the notion for something finer than a wonderfully fine thing to finish off your pride and joy has come to mind, a beautifully hand-crafted leather saddle or saddle bag might be just the unique touch required to set it apart from the humdrum. examples of tim's work can be seen in the velorama bicycle museum in nijmegen in holland, as well as in various private collections around the world. if you'd like to know more, you can read tim's blog, or take a leisurely wander through his flickr galleries. if either give rise to want, want, want or untold desire, drop tim an e-mail. many thanks to tim dawson for his assistance with this article.